Up first are the questions and answers. Already an affiliate marketing aficionado? Awesome. Click here to jump ahead. 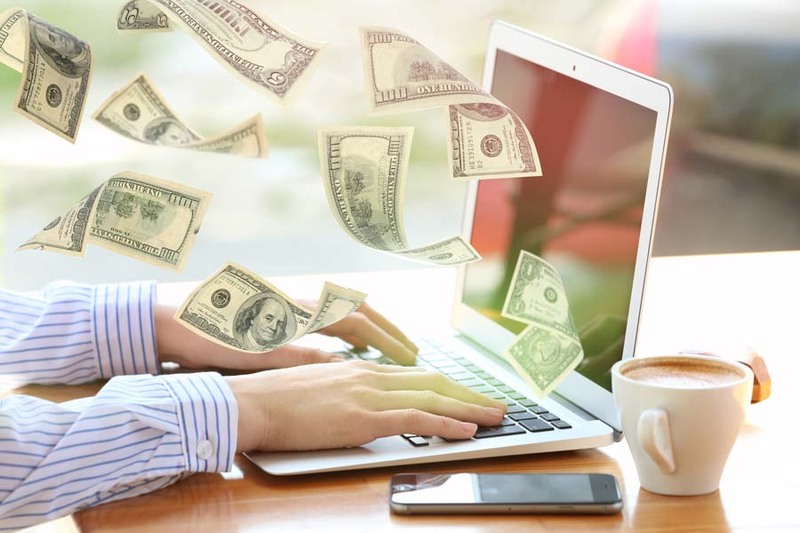 Affiliate networks are middlemen connecting bloggers and entrepreneurs (“publishers”) with companies (“merchants”) offering affiliate program opportunities for their products or services. Through a single portal, affiliate networks give publishers access to numerous affiliate programs. You monetize your blog with these affiliate programs by using a process called affiliate marketing. Affiliate marketing is a new twist on an old idea: getting a finder’s fee when you refer a customer. You introduce your audience to a product or service and, if they buy using your unique affiliate link, you earn a commission. In short: find a product or service you like, promote it to your blog’s readers, and earn part of the profit on each sale. Pat Flynn of Smart Passive Income earned over $2 million through affiliate marketing in 2017. John Lee Dumas of Entrepreneurs on Fire earned $37,974 — in November 2018 alone. Slightly (ahem) on the other end of the spectrum, one of my affiliate programs has earned $3,450 over a span of 3 years. That’s not “quit my job” money. It’s not even “hire Nicolas Cage to attend my birthday party” money. However, as passive income resulting from a single blog post I wrote years ago, it’s not too shabby. Your mileage can and will vary, of course. But it’s definitely possible to make real, tangible, passive income through affiliate marketing. Smart, attractive people just like you do it every day. That’s what I’m going to help you figure out. I’ll give you the breakdown (in no particular order) — you choose the network that best fits your needs. Long track record. Founded in 2000, ShareASale has been around the block a time or two. Numerous affiliate opportunities. 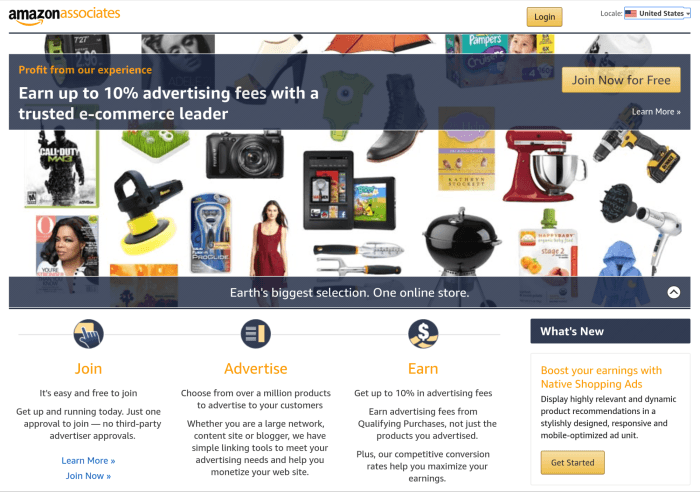 ShareASale offers over 3,900 affiliate programs in 40 different categories. Safe and secure. With zero customer complaints on file, the Better Business Bureau gives ShareASale an A+ rating. Consistent payment schedule. On the 20th of each month, so long as you have a balance of at least $50, ShareASale sends you money. Different payment options. You can have ShareASale pay you via checks in the mail, wire transfer, or direct deposit. International men and women of mystery can use the transfer service Payoneer. No PayPal, though. Thanks in part to its solid reputation, ShareASale is trusted by quite a few big-name companies. Over 1,000 merchants, such as WP Engine and OptinMonster, are exclusive to the network. If you want to advertise their products, you can only do so through ShareASale. Anyone who’s looking for a reliable affiliate network that offers a wide variety of affiliating marketing options (thus eliminating the need to join multiple networks) should give ShareASale a try. Whether you want to offer services, physical goods, or digital downloads to your audience, ShareASale has you covered. Millions of options. Clickbank offers more than 6 million unique affiliate products. Quick to respond. With zero unresolved complaints as of this writing, Clickbank sports an A+ rating with the Better Business Bureau. Flexible payment schedule. Clickbank lets you choose how often you want to get paid. Want monthly payments? You got it. Weekly? Done. Variety of payment options. Check, wire transfer, and direct deposit are available. International users can get paid through Payoneer. Alas, no PayPal here either. By focusing on digital products created by entrepreneurs from all over the globe, Clickbank offers affiliate opportunities you can’t find anywhere else. While Clickbank itself, the network, has a solid reputation, some of the products offered by its merchants can be questionable. You have to do your homework. If you do, you’ll be fine. If you don’t, and you end up promoting some subpar products, your audience won’t be happy. 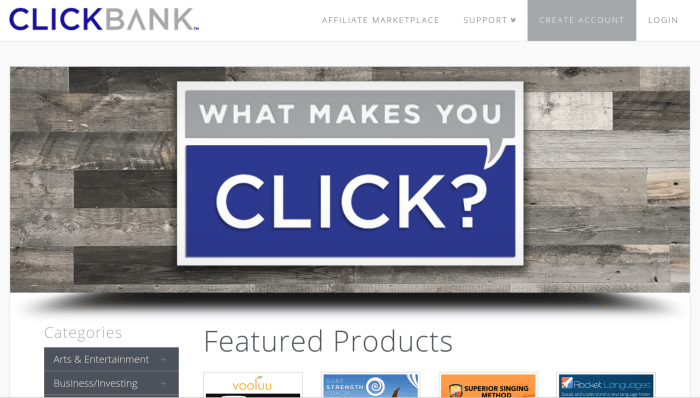 If you’re looking to exclusively promote digital products, and you want (literally) millions of options, Clickbank is a good bet. Two decades of experience. Founded in 1998, CJ Affiliate was around during Y2K and lived to tell the tale. Lots of brands. CJ Affiliate gives you access to more than 3,000 merchants. Too big to fail. CJ Affiliate is part of Alliance Data Systems, which is a Fortune 500 company. It also has an A+ rating with the Better Business Bureau. Get paid monthly. CJ Affiliate combines all your commissions into one monthly payment. Two payment options. Get paid by direct deposit or checks in the mail. PayPal is a no. What Makes CJ Affiliate Different? It offers lots of bells and whistles, such as real-time reporting. That means you can monitor activity on your account as it happens. Who Should Join CJ Affiliate? Anyone with an established audience who wants a feature-rich affiliate network will find a lot to like with CJ Affiliate. However, it may not be a good choice for beginners. Because accounts are deactivated if you go six months without earning a commission, and because their merchants have a reputation for being picky on who they accept as publishers, CJ Affiliate is best for those who get steady traffic to their websites. However, if you already have an audience of modest size and engagement, you’ll appreciate what CJ Affiliate has to offer. One of the first online marketing networks. Started in 1996, Amazon Associates is old enough to legally drink alcohol. Huge selection. Publishers can promote Amazon’s massive catalog of physical and digital products. Backed by Amazon. Valued at over $1 trillion, and with over 90 million paying Prime subscribers in the United States, Amazon isn’t going anywhere anytime soon. The Better Business Bureau gives the company a B+ rating. Not the best payment schedule. Amazon Associates pays you approximately 60 days after the end of the month in which you earned your commission. Several payment options. You can get paid by direct deposit, Amazon gift certificates, or checks in the mail. (Tip: Avoid checks in the mail since there’s a $15 processing fee.) International users can get paid by gift certificates or checks (with the $15 fee waived). What Makes Amazon Associates Different? By offering the entire Amazon catalog, no affiliate network can match the sheer volume of physical and digital products offered by Amazon Associates. Including affiliate links in emails is against Amazon’s company policy, so keep this in mind if email marketing is your primary method for promoting affiliate products. Who Should Join Amazon Associates? Affiliate marketers who are familiar with the Amazon ecosystem will feel right at home with Amazon Associates. Those looking to promote services should look elsewhere, but anyone who wants to focus on physical and digital products will find millions of different opportunities in hundreds of different categories with Amazon Associates. Founded in 2008. Though the eBay Partner Network is a relative newcomer on the affiliate network scene, its parent company (eBay) has been around since 1995. Billions of opportunities. eBay has 1.1 billion listings. You’ll never run out of physical products to promote to your audience. Backed by eBay. With 175 million buyers purchasing over $23 billion of merchandise each year, EPN’s parent company (eBay) is built to last. The Better Business Bureau gives the company an A+ rating. Reliable payment schedule. So long as you’ve earned the minimum of $10 needed for payment, EPN pays you monthly. What Makes eBay Partner Network Different? One thing that sets EPN apart from other affiliate networks is the way it lets you promote… unique offerings. The great Weird Al Yankovich once sang about buying William Shatner’s toupee on eBay. With the eBay Partner Network, if such a transaction ever takes place, you could earn a commission on it. Who Should Join eBay Partner Network? If your focus is on physical products and you want the peace of mind that comes with doing business with a large company you’re already familiar with, eBay Partner Network is a great option. New (ish) kid on the block. Founded in 2008, FlexOffers doesn’t have as long of a track record as most of its competitors. Growing list of affiliate opportunities. FlexOffers has 12,000+ merchants in 25+ categories across 27 (and counting) countries. And they say hundreds of new merchants are added each week. No rating with BBB. Partly due to its relative youth, FlexOffers doesn’t have a rating with the Better Business Bureau. On the upside, BBB shows zero complaints with the company. Quick payments. One of the areas where FlexOffers shines is with payments. When you refer a sale, your commission is paid within 30 days (so long as you meet the minimum balance of $50). And if you’re a top performer, it’s possible to be paid within 7 days. Standard payment options. U.S. residents can be paid by check or direct deposit. PayPal is available for those outside the USA. When you sign up with FlexOffers, you’re assigned a dedicated account manager to help you navigate the affiliate marketing waters. 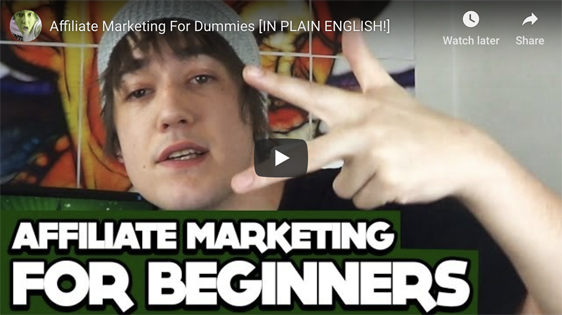 This makes it a good fit for both beginners and veterans of affiliate marketing. Don’t let its youth fool you. If you want lots of affiliate options, great support, and quick turnaround on payments, FlexOffers is a solid contender. New to the affiliate network game. Though it’s been in the digital marketing business since the 90s, Pepperjam started its own affiliate network in 2015. Quality over quantity. With only 1,500 merchants, Pepperjam has fewer options than its competitors. Why? Well, according to Pepperjam, it’s because they only work with brands they love. An open book. The Better Business Bureau gives Pepperjam a B+ rating. With its focus on transparency and communication (more on that below), Pepperjam goes out of its way to show it has nothing to hide. Payments twice a month. So long as you meet the minimum $25 balance, Pepperjam pays you twice a month. Payment cycles are around the 1st and 15th of each month. Lots of payment options. Pepperjam lets you get paid via PayPal (which is the default payment method), check, or direct deposit. Publishers and merchants can communicate with one another inside the Pepperjam system. Want to ask a merchant who caught your eye a question? Have at it. Flirt away. Pepperjam actually encourages communication so strong relationships can be built. If you value transparency and customer support, you’ll be hard pressed to do better than Pepperjam as an affiliate network. One of the oldest affiliate networks. Founded in 1996, Rakuten Marketing (formerly LinkShare) has been hooking up merchants and publishers for over two decades. Only 1,000 merchants. Though it’s been in the affiliate networking game longer than most, Rakuten’s list of brands is shorter than most. However, this somewhat short list is made up of many household names. Loved by BBB and guys on social media. Rakuten has an A+ rating with the Better Business Bureau. It’s also been called “cool” by someone named Kenny on Twitter. Sporadic payments. Rakuten only pays you after the merchants have paid them. So, if you earned a commission in January, it would be invoiced in early February, the merchant would have a due date to pay Rakuten by February 28, and Rakuten would pay you in March. Solid payment options. Direct deposit, check, and PayPal (in certain markets) are all offered by Rakuten. What Makes Rakuten Marketing Different? It’s been ranked the #1 affiliate network for 7 straight years by an industry publication that presumably knows about such things. Who Should Join Rakuten Marketing? If you want an affiliate network with an intuitive user interface, a great reporting system, and the kind of solid reputation you can only earn by being in the business for two decades, Rakuten Marketing is a great selection. A decade of experience. Launched in January 2009, PeerFly came into existence when Taylor Swift was still a country music singer. Numerous selections. PeerFly has over 2,000 clients and over 8,000 affiliate opportunities. Small team that plays big. Comprised of only 15 individuals, PeerFly is a small company that goes toe to toe with its bigger competitors. The hard work pays off with an A+ Better Business Bureau rating and zero complaints on file. Net30 Payment Schedule. PeerFly offers fast payment. So long as you’ve met their $50 minimum, you’ll be paid the following month after earning your commission. All the payment options. If you’re in the U.S., PeerFly lets you choose between PayPal, Bitcoin, Amazon gift cards, checks, and direct deposit. International users have PayPal, Bitcoin, and Payoneer. PeerFly is known as a CPA (cost per action) affiliate network rather than the typical CPS (cost per sale). The “action” could be a sale, but it doesn’t have to be. It could be whatever action (downloading an eBook, filling out a survey, etc.) the merchant desires. 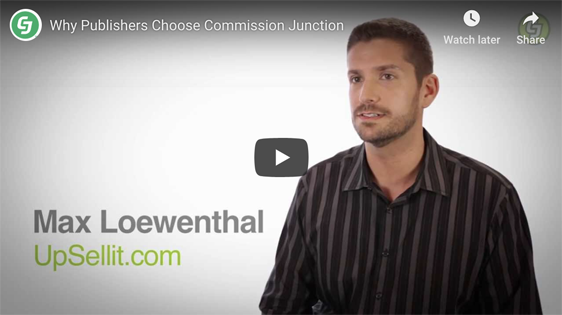 Though individual commissions typically aren’t as high for CPAs, the number of commissions is usually higher. If you’re a beginner or have a small audience, PeerFly’s CPA model is a good option. Actions are easier to obtain than sales, so your chances of success will be higher. And if you’re an old pro at affiliate marketing, the large selection and flexible payment options offered by PeerFly should serve you well too. Which affiliate network are you joining today? Which one is going to launch you on the path towards Pat Flynn and John Lee Dumas levels of ginormous passive income in 2019? You now know the track records and distinguishing details of 9 great affiliate networks. Passive income isn’t a myth. It’s real. It’s out there. And it’s yours if you want it. About the Author: When he’s not busy telling waitresses, baristas, and anyone else who crosses his path that Jon Morrow said he was in the top 1% of bloggers, Kevin J. Duncan uses his very particular set of skills to help bloggers improve their craft.